We’d love your help. Let us know what’s wrong with this preview of Cicada by Shaun Tan. To ask other readers questions about Cicada, please sign up. Cicada has worked as a data entry clerk in a tall office building for seventeen years. For all those years he has been treated horribly by the humans. But, today is Cicada's last day. What Oh, The Places You'll Go! is to graduation gifts, this book should become to retirement gifts. Shaun Tan is the author of the wordless masterpiece, The Arrival. Cicada is less ambitious, more minimal on almost every level, though it does feature about 150 words, written in a kind of representation of how some Asians might speak if they are learning English. So I think Cicada is Asian, and I think this book is about racism and class-ism, as Cicada is mistreated at work by other people because Shaun Tan is the author of the wordless masterpiece, The Arrival. Cicada is less ambitious, more minimal on almost every level, though it does feature about 150 words, written in a kind of representation of how some Asians might speak if they are learning English. So I think Cicada is Asian, and I think this book is about racism and class-ism, as Cicada is mistreated at work by other people because they think he doesn't belong there even though he quietly and efficiently does his job without complaint. The job is data entry, he is underpaid, disrespected at every turn, and he works in these corporate offices for many years, bullied. A happy and somewhat surprising transformation happens at the end--Cicada has the last laugh, shall we say--but in most of the book he is pretty miserable. It's not a young children's picture book; maybe tweens can begin to appreciate it, but I prefer to think of it as an all ages book. I thought of Kafka's "Metamorphosis," about another corporate guy who wakes up one morning to find he is a bug, with a different kind of ending, of course. What an absolutely delightful book! Aussie author Shaun Tan is one very talented man! The artwork in Cicada, a short but beautifully written children’s book, is spectacular; the story wonderful. Cicada has been working for the same company for seventeen years – a hardworking little guy who was completely unappreciated. But he gets the last laugh – as I did – in the end! I loved it, my grandchildren love it – it’s one to recommend highly. Magic! With thanks to Hachette AU for my copy to read and r What an absolutely delightful book! Aussie author Shaun Tan is one very talented man! The artwork in Cicada, a short but beautifully written children’s book, is spectacular; the story wonderful. With thanks to Hachette AU for my copy to read and review. Brenda Totally agree Charlie - he's very talented!! I love Shaun Tan but this one was a massive disappointment. It looks as you would expect, bleakly gorgeous. But it takes about one minute to read and lacks much of the charm and depth of all his other works. Back to reread the The Red Tree and The Arrival to cheer myself up . A picturebook that nudges close to being wordless with only 150 words throughout and many of them repeated, Cicada tells the story of a little bug who spends 17 years working thanklessly and largely ignored in a high-rise office. The world he inhabits flits between shades of grey and his green skill and dark bulbous eyes provide the only contrast in the dull world he inhabits. As with all Tan's books, meaning may not come to the reader immediately but this is purposeful. Tan states that he ofte A picturebook that nudges close to being wordless with only 150 words throughout and many of them repeated, Cicada tells the story of a little bug who spends 17 years working thanklessly and largely ignored in a high-rise office. The world he inhabits flits between shades of grey and his green skill and dark bulbous eyes provide the only contrast in the dull world he inhabits. As with all Tan's books, meaning may not come to the reader immediately but this is purposeful. Tan states that he often knows that he is writing about a universal truth with regard to humanity's impact on each other or the world. How clear that truth is remains up to the reader. He also speaks of a need for his work to be honest and hopes that each book he writes helps make the real world a little more understandable. Perhaps then, there are three elements of Tan's life and philosophy which help cast a little light on this wonderful but (potentially) sad story. Firstly, that Tan's father was a Chinese immigrant to Australia and that communicating with his father, fluently has always been a challenge. Tan also speaks of an elderly Greek neighbour and her broken English too. Touching upon the idea of communication and the problems it can bring as well as the falsehood we attach to people who speak broken English and intelligence is one to consider - especially in light of the rather touching and beautiful ending. I don't know how, in 150 words, Shaun Tan ripped my heart out and then breathed it back to life. His drawings, detail and observation of life is nothing but raw and beautiful. Immediately after finishing it, my first thought was: "How burdened and grey we are, without freedom and creativity." As usual, another work of Shaun Tan's that is not only beautiful, but soulful, and I will no doubt be cracking this open many more times to revisit this cute, sad, honest and revitalising story. This review has been hidden because it contains spoilers. To view it, click here. Simple, sad and ultimately, uplifting. Depressing. Wish we could have seen the forest he went to. The green and beauty might have helped this to be a tad less bleak. 4 solid stars. Čítam už asi desiaty krát, ale to prvé kmitnutie cikádích krídel mi zakaždým rozseká dušu na franforce. Another stunning book from Shaun Tan, with a really important message about racism and immigrants, but told by a cicada. Having an insect (something that is decidedly not human) in place of a human who is treated the same as migrants will hopefully open some eyes. There's a real gut-punch here towards the end which probably won't mean much to kids but is sure to get to adults reading the book to them. This is my second reviewing of this one (for a challenge). The grandkids love it; the big kids love it (us!) So beautifully illustrated and written by Aussie author Shaun Tan, as are all his books. It's a book to read over and over again; one you'll never tire of. This magical read is highly recommended. Cicada is a work that packs a punch regardless of your age. Shaun Tan had my family – my 62 year old mother and 46 year old partner, as well as my 7 and 4 year old nieces – quiet, contemplative and on the edge of their seats. On the surface, this is a commentary about the inanity and heartlessness of 21st century corporate life, told through the eyes of the eponymous Cicada. But this brilliant short story is of course more than that. In only 150 words (many of them repeated), Tan evokes powerful Cicada is a work that packs a punch regardless of your age. Shaun Tan had my family – my 62 year old mother and 46 year old partner, as well as my 7 and 4 year old nieces – quiet, contemplative and on the edge of their seats. On the surface, this is a commentary about the inanity and heartlessness of 21st century corporate life, told through the eyes of the eponymous Cicada. But this brilliant short story is of course more than that. In only 150 words (many of them repeated), Tan evokes powerful emotional responses as he illustrates literally and metaphorically what it is like to be different, to be alone, and to be marginalised. Cicada has any number of interpretations, and it is a story I expect every reader will identify with. Depending on your own view point, it is a story about feeling alone before finding your tribe, about being exploited before taking control, about losing your way before finding your calling. Cicada is not a tale to make you laugh. The refrain ‘tok, tok, tok’ represents everything we feel but can not always express in words. It is injustice, it is abandonment, it is cruelty. But Cicada is also full of hope. By the end, ‘tok, tok, tok’ represents liberation, freedom, and that glorious feeling that all is right with the world. If you are an adult, Cicada will make you question how you spend your days. Somehow, by the end of those 150 words office life feels like the punchline of a cruel joke. But Cicada is also a conversation starter. If you have a younger reader in your orbit who may be feeling different from their peers or left out by those around them, this is a story to spark all sorts of discussions. Despite being set in an office (not the usual haunt of either cicadas or children), Cicada is accessible to younger readers. Whether they are being read to or exploring Tan’s world on their own, Cicada will be a childhood tale that resonates with them into adulthood (as Toni Ungerer’s illustrated version of Han Christian Anderson’s The Little Match Girl still resonates with me). This children's picture book by Shaun Tan is about Cicada, who is employed in an office as a data entry clerk and is under-appreciated and bullied in the workplace. I instantly felt for Cicada and was astonished at how quickly I became caught up and invested in his work/life circumstances. The illustrations and minimalist accompanying text are simple yet surprisingly moving. 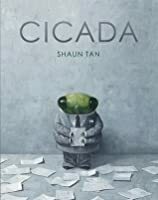 This is an exploration of bullying within the corporate environment and I think many readers - regardless of age - will re This children's picture book by Shaun Tan is about Cicada, who is employed in an office as a data entry clerk and is under-appreciated and bullied in the workplace. I instantly felt for Cicada and was astonished at how quickly I became caught up and invested in his work/life circumstances. The illustrations and minimalist accompanying text are simple yet surprisingly moving. This is an exploration of bullying within the corporate environment and I think many readers - regardless of age - will readily identify with the themes of loneliness, belonging and transformation. The only reason this wasn't a five star read for me was the ending. I just didn't get it! I've read it over and over and just don't understand why they laugh at the end. 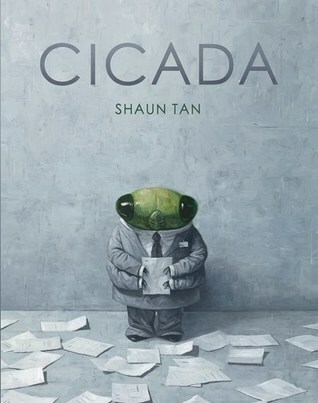 Shaun Tan is an acclaimed Australian creator of picture books for children and Cicada is his latest release. This delightfully presented hardback contains moving artwork and splendidly evocative end papers and Cicada is a character I won't forget any time soon. Cicada is another head scratching, wonder inducing read by Shaun Tan. Once again, I find myself saying, “Hmmm,” after a Tan read. But isn’t that what magic is sometimes? The not knowing? The wonder! The mystery! We are introduced to a suit clad cicada toiling away in a cubicle and living in the walls. He’s underappreciated and bullied. Humans walk all over him. Then after 17 years of work, cicada makes his way out, to the surface and transforms. Cicada changes and grows and finds a beautiful new life. Or ending? Is this a story of growing up? Of surviving? Is it meant to be sad? Inspirational? You’re going to have to read and decide for yourself. Much of cicada’s journey felt dark and sad in the gray pages to me. We get little flashes and bursts of color that catch the eye though. There was a bit of hope at the end, but *shakes head* I really can’t tell you for certain what this book is meant to say or even what it said to me. Haha…That sounded bad, but I don’t mean it to. Shaun Tan always puts something new and special out here in the world to experience. His work never fails to make me curious. I’ve read this book again and again and again looking for meaning. And maybe that is the point—to look. Open your eyes and really look at this book and the world around you. These dark, beautiful pages make me feel and wonder. Check this one out! It’s a unique little book packaged like a picture book for kids, but it’s more of a graphic novel for all ages. Please let me know what you think! For anyone who has been under-appreciated, over-worked, ignored or misunderstood Shaun Tan's latest offering, Cicada, will break your heart, then put it back together again. He does it to me EVERY SINGLE TIME! With his magic combination of perfect word choice and stunning illustrations, Tan brings Cicada's internal life to light. I'd love to tell you more about it, in great detail, but I want you to discover the joy of this story for the first time yourself. 150 perfectly chosen words. Reading this book, and taking in the illustrations was a truly immersive experience. Shaun Tan is a master of his craft, expressing so much and eliciting such strong emotions. I finished reading it and immediately thrust it into the hands of everyone standing near me. One to reread often. I choked up, cried sad tears. Then I cried happy tears. Then I thought about the book all day. Shaun Tan is a genius. 2.5 stars - 3 stars. Every Shaun Tan book is amazing. A journey. A trip. A world. This is one of his very best. This picture book must be for an older age group than most books of this kind. Cicada works in data entry and is mistreated, bullied, underpaid, and underappreciated. That ending though! Was it only me or did something feel lost in translation? The art is fantastic, but this is a Shaun Tan book, so I wouldn't expect anything else. The text however was rather pedestrian, and didn't convey as much as some of his wordless books do. 4 stars for the art, 1 star for the text, and I rounded up 2.5 stars. Strange, but oddly resonant tale of the seventeen years of a cicada's wait to break free from its shell and emerge as an adult. 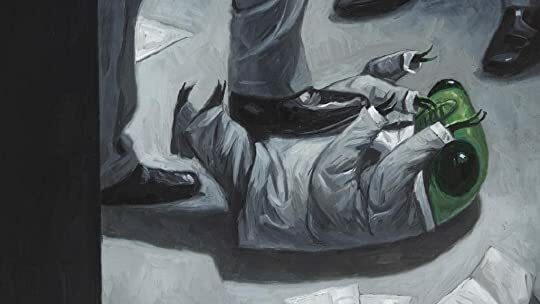 The illustrations, created using oil on canvas and paper, are dark and often foreboding with just the touch of green and later, red. They convey the solitude of the cicada in his long wait, and the anthropomorphicized cicada in his business suit seems all too human. The bullying of the cicada is terrible and makes me think of the racism that is still rampant in our countr Strange, but oddly resonant tale of the seventeen years of a cicada's wait to break free from its shell and emerge as an adult. The bullying of the cicada is terrible and makes me think of the racism that is still rampant in our country. Gripping, suspenseful, surprising, sad, beautiful, smart. Shaun Tan is, as always, an inspiration to anyone thinking about creating something original and to anyone wanting to be moved by experiencing something original. Anyway, Tan manages once again to completely rip open my heart and then give it back to me with a tiny little piece of hope to mend it, like using kintsugi on a bowl or cup. I don't really want to say much about the story, because the synopsis does a pretty good job, I just urge you to have a read and then have a think about what Tan could be addressing, what it all means, and maybe to swoon over his art. At least a little. Subtle, complex and a work of great beauty. On one level, it's a transformative tale about a downtrodden bug. On another, it feels like the story of every Asian-Australian kid in a corporate environment. All the feels. So brilliant. Shaun Tan is a master storyteller. Minimal text - emotive punch. Last few pages ... breathtaking. Cicada works in a building, and is an overworked, unappreciated data entry clerk. Cicada works and works. No matter how he's treated or ignored or doesn't fit in. OMG. This book is beautiful. Not just because the artwork is absolutely stunning, but because the simple story is one that hooked me in from the very beginning. I kept reading and went through so many emotions. By the end, I had tears in my eyes and they weren't entirely from heartbreak. It's amazing how such a wonderful story unfolds with minimal--but totally gripping--details. A lot of it also has to do with the amazing and eerie art. I loved this. It's so cute. Nejlepší "kafkovské" velkoformátové ilustrace široko daleko. Shaun Tan v budoucnu prostě MUSÍ ilustrovat Proměnu; přes to vlak nejede. Jiná věc je, že je zde i jakýsi tuctový text, kde to již s tím jakože podobenstvím a jakože kafkárnou není nijak valné. Navíc je to mikrominimalistické a celé (včetně anotace, tiráže, čárového kódu a signatury městské knihovny) to zabere sotva tři minuty čtení/prohlížení. Poignant. Concise. Quick to read, but keeps you thinking about it long after. An allegory for the plight of exploited, hard-working Asian immigrants, I think, and it's hopeful and made me really care. I thought of The Arrival, and then realized it's the same author. Of course! Shaun Tan (born 1974) is the illustrator and author of award-winning children's books. After freelancing for some years from a studio at Mt. Lawley, Tan relocated to Melbourne, Victoria in 2007. Tan was the Illustrator in Residence at the University of Melbourne's Department of Language Literacy and Arts Education for two weeks through an annual Fellowship offered by the May Gibbs Children’s Liter Shaun Tan (born 1974) is the illustrator and author of award-winning children's books. After freelancing for some years from a studio at Mt. Lawley, Tan relocated to Melbourne, Victoria in 2007. Tan was the Illustrator in Residence at the University of Melbourne's Department of Language Literacy and Arts Education for two weeks through an annual Fellowship offered by the May Gibbs Children’s Literature Trust. 2009 World Fantasy Award for Best Artist.